NEW!! Limited edition 77A Durometer available for purchase. 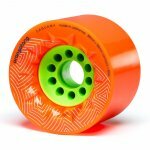 The Caguama is Orangatang's biggest wheel to date!! Coming in at a whopping 85mm, it is everything you have ever wanted. Utilizing the Orangatang's Happy Thane formula, this wheel rolls very fast, has high rebound, and provides a super smooth ride. Available in two durometers, 80a & 83a, you can customize your setup for the feel you want! 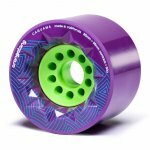 In addition, rather than being your standard squared lip cruising wheel, Orangatang took the stone to the corner of the wheel and rounded it over. Leaving the rest of the wheel tacky allows for great grip on the road while also giving you the opportunity to skert out a little slide if you are feeling risky! Lastly, Orangatang also gave the Caguama a diamond faceted front face which gives the lip of the wheel a unique flex pattern... This also just makes the wheel look flipping sweet! So don't drag your feet, this wheel is gonna go fast! 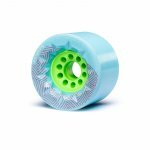 Bonus* - The Caguama uses the same core as the Kegel, this means electric skateboard gears that fit the Kegel will indeed fit the Caguama!